Have you ever wondered what a far away place looks like, but can’t find the means to go see it? Now you can. Google (who is constantly releasing new stuff that no one ever knows about) is now adding Street View panoramas of the world’s wonder spots. 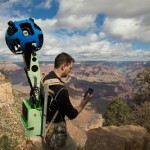 This blog post from Google highlights their latest addition – the Grand Canyon. I gave it a spin, and it is pretty wild stuff – you can pick where to start and then hike down the trail, looking around as you go. It does get a little old after a while, so it might be nice to offer a side-by-side map view as well. Maybe they do, I just don’t know about it. Google probably has lots of other scenic places photographed as well, but how you find them is up to you dear reader. Happy treasure hunting.